Are the struggling 3D printing company's long-term investors well-served by its new CFO's compensation package? 3D Systems'(NYSE:DDD) new chief financial officer, John McMullen, started the job on July 1. McMullen, formerly the CFO of Eastman Kodak, previously worked with 3D Systems CEO Vyomesh Joshi at what was then Hewlett-Packard Co. and is now HP Inc.
Joshi, who took over the top spot at the struggling 3D printing company in April, is still getting his management team in order. In addition to McMullen's appointment, 3D Systems in June also announced the departures of its chief marketing and chief operating officers; both of those positions are as yet unfilled. Let's take a look at McMullen's compensation package, keeping in mind that investors want to see the company pay enough to attract top talent, but not be overly generous. Ideally, the makeup of top executive compensation packages will be aligned with the best interests of long-term shareholders. This is especially important with CFOs, as they control a company's financial strings and set its financial roadmap. Thus they can significantly affect a company's reported financial results, which in turn drive its stock's performance. The following chart summarizes McMullen's compensation package, according to 3D Systems' SEC filing. The employment agreement has an initial two-year term. Data source: SEC filing. *Excludes cost of $1 per share to acquire restricted stock and $12.92 per share to exercise options. **$12.92 is closing stock price on the date of McMullen's employment agreement. All scenarios assume the 25,000 shares that automatically vest on McMullen's first and second anniversaries are trading at the same price (unchanged/$12.92, $30, or $40) that is achieved by the shares during that year, as indicated. This is unrealistic, but it's a decent ballpark. Don't get hung up on the details. The bottom line is that McMullen is heavily incentivized to drive the stock price over $30 and then again over $40. He could make as "little" as $2.1 million (or less, if the stock price is lower than $12.92 at the time of his anniversaries) over two years if the stock price objectives aren't met; and as much as about $9.6 million if all stock price objectives are achieved in year one. Joshi has a very similarly comprised compensation package, though with higher numbers, so he's also similarly incentivized. Does this align with the interests of long-term investors? The short answer: It's better aligned with the interests of long-term shareholders than were the company's former top executive compensation packages, but it's not ideal, in my opinion. 3D Systems has recently changed the structure of its compensation packages for top execs. Neither its former CFOs (McMullen is the fourth CFO in less than two years) nor its longtime former CEO Avi Reichenthal had stock-based incentives linked to the company's stock price -- nor to any other financial performance metrics, for that matter. On predetermined dates or at the discretion of the board's compensation committee, these execs received stock options and shares of restricted stock, which vested on predetermined dates, regardless of the company's performance or stock price. The new packages are a step in the right direction, as they at least provide some objective performance incentive. That said, incentivizing top execs to drive the company's stock price higher can result in their making decisions aimed at boosting a company's short-term financial performance at the expense of its long-term performance. This isn't to suggest that McMullen isn't in the game for the long term. However, the board could have done a better job aligning his performance incentives with the interests of long-term shareholders. 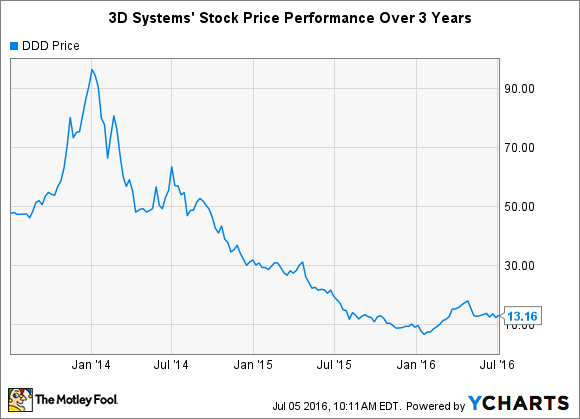 Keep in mind how 3D Systems' CFO -- and CEO -- are being incentivized as you make your stock buy, hold, and sell decisions.